In a nation built by immigrants and bedeviled by the history and legacy of slavery and discrimination, how do we, as Americans, reconcile a commitment to equality and freedom with persistent inequality and discrimination? And what can we do about it? This widely acclaimed text by Paula D. McClain, with new coauthor Jessica D. Johnson Carew, provides a comprehensive and accessible overview of the historical and contemporary political experience of the major groups-African Americans, Latinos, Asian Americans, and American Indians-in the United States. It explores the similarities and differences in these groups' representation and participation in law, politics, and policymaking, discusses the enduring issues and concerns that they face, and examines intra- and inter-group competition and coalition-building in the face of enduring conflict and inequality. 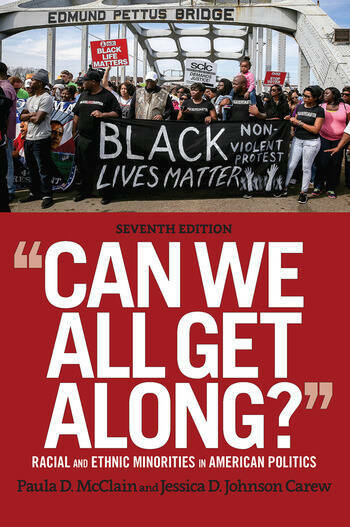 The seventh edition has been thoroughly revised and updated to include coverage of President Barack Obama's second term, the 2016 election, police brutality and Black Lives Matter, and the Dakota Access Pipeline protest movement. With a brand-new chapter on the intersections of race and gender, Can We All Get Along? remains unparalleled in its comparative coverage of the current landscape of minority politics in the United States. 6 Will We "All Get Along"?